CountyComm specializes in tactical and EDC (every day carry) gear. They have many innovative solutions for EDC and lightweight camping. Browsing their site will get the creative juices flowing and have you thinking of how you can use all of the cool gadgets. 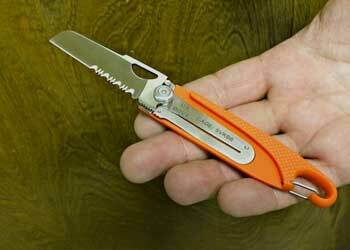 The item reviewed in this post is the EDC Pocket Knife with the sheeps-foot blade. The knife also comes in a drop point blade. Both versions are available in black or orange. 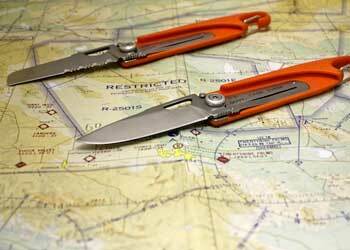 The International Orange EDC Rescue Pocket Knife is privately contracted for a local SAR (Search & Rescue) team. This knife is a CountyComm exclusive and is limited to only a couple hundred units. The carabiner style clip will keep it securely attached to vest, backpack, keyring, belt loop or just about anywhere you need to clip it. The 2-1/2″ blade is 440A stainless steel with a satin finish for low reflectivity . The textured Zytel® handle keeps the knife extremely lightweight and the liner style lock adds safety. Measures 4″ closed and weighs only 1 oz. Cost – $17.50, but currently on sale for $13.50. As I’ve stated before, I’m not a big knife person, but I still carry a knife on all of my trips. As the ultralight bug has bitten me over the last two years, the knife in my pack has gotten smaller and smaller. In his book “Ultralight Backpackin’ Tips” Mike Clelland goes to the limits by recommending carrying only a razor blade for a 10 day trip. Most of us may not be ready to go that far, which is where the EDC Pocket Knife comes into play. Overall, the knife is well constructed and feels comfortable in your hand. The blade locks when opened and the handle is just long enough to get a full grip. The knife shipped with a sharp edge and it has maintained it over several months of use. The combination blade on this version of the knife gives you both a serrated and a straight blade. The drawback is that the straight blade portion of the blade is just over 1″. It’s enough for basic camping needs and having the multi-purpose benefits of the serrated portion more than makes up for the shorter straight blade. On the end of the handle, there is a small carabiner clip which is a nice feature. This allows the knife to be carried on a lanyard, clipped onto a backpack strap, or clipped on a keyring for EDC. Like a lot of other CountyComm products, the knife is offered in a high visibility orange or a more stealthy black. For camping items, the orange is a no-brainer. If it’s dropped on the ground, the color makes it much easier to find. 4.5 stars – the knife works as expected with no issues. The knife strikes a great balance between the SUL (super ultra light) philosophy of “a razor blade can do it all” and the more traditional “I gotta have a big sharp knife” philosophy. It’s much closer to the SUL side, but is still very reliable and useful. For a weight of 1 ounce, you can afford to carry this knife as part of your kit with the comfort of knowing you have a real blade in your kit. Instead of trying to eliminate the knife from your kit, there are much better places to focus your weight savings attention. If you are new to the ultralight camping arena and still like the warm fuzzy feeling of a knife in your kit, this is one worth considering. For $15, you’ll also be hard pressed to find a more functional and lightweight option. If it is a genuine Victorinox Swiss army knife, the blade shulod be adequate for many uses; however, if the blade leaves alot to be desired, I suspect it is an imitation. A true Victorinox will keep and edge and is sturdy. 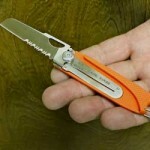 If all the other aspects of the knife are meeting your needs, then go ahead and get a plain pocket knife. 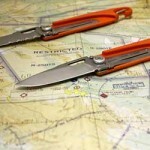 Be sure to compare the prices of a plain pocket knife and one with all the tools. It might be worth buying a whole new knife.You can get a Victorinox without all the tools. That would be my first choice. I used to have an Old Timer which was pretty good, but that was over 20 years ago. I’ve pretty much stuck with Victorinox pocket knifes ever since I’ve gotten my first one. I also have a Gerber lock blade. Those are also great knives, but may be larger than what you’re looking for. I am not sure if Gerber makes a smaller pocket knife. I’ve only sharpened my Gerber once.